Rakhi, is a festival primarily observed in India, which celebrates the relationship between brothers and sisters. 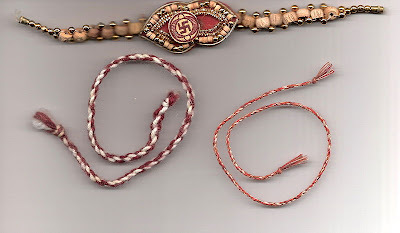 It is also called Rakhi Purnima in most of India.It is also celebrated in some parts of Pakistan.The festival is observed by Hindus, Sikhs and some Muslims. The central ceremony involves the tying of a rakhi (sacred thread) by a sister on her brother's wrist. This symbolizes the sister's love and prayers for her brother's well-being, and the brother's lifelong vow to protect her. The festival falls on the full moon day (Shravan Poornima) of the Shravan month of the Hindu lunisolar calendar. It grew in popularity after Rani Karnavati, the widowed queen of Chittor, sent a rakhi to the Mughal emperor Humayun when she required his help.